It is early March, the temps are in the 60s and the market is heating up as well. Inventory is still low and buyers are hitting the streets already in pursuit of a great home. If you ask most buyers about their concerns or struggles in today’s market, they pretty much all have the same two answers: not enough to choose from, and once they do find a great home, how they can win the bidding war. So when it is a seller’s market, how do you position your offer for success? How can you make your offer stand out from all of the rest? Or, how can you convince a seller to accept your offer before any other offers come in? Here are some best practices when creating your offer. I use this same criteria to evaluate the pros and cons to each offer that we receive on our listings as well. 1. You only have one chance to make a first impression. What lasting impression will your offer leave? When inventory is tight, we coach our clients to make a strong offer right away. There is no time for poker here. Make an offer based on actual comparable sales in the area and then take in to account the current inventory. If there are only one or two homes for sale in a highly coveted area, you better be ready to pay top dollar. Please keep in mind that top dollar today is still well below 20 percent of the peak values that we once had in 2006. Also, if the last two or three homes in the area have sold for 103 percent of list price, you might consider offering more than list price to get the sellers attention and to possibly scare away any other offers. 2. Place time on the seller’s side. Allow the seller to name the closing and possession date. Yes, you may want your new home tomorrow, but the seller may desire 60 days before they have to move. Time is money (or can be) in this case. I have seen sellers accept a lower offer on their home simply because the buyer allowed them to set the pace of the closing timeline. Finally, allowing a few days in between closing and possession is crucial for most sellers. It amazes me the number of offers that we receive on our listings with closing and possession on the same day. Didn’t the buyer notice all of the furniture and belongings in the house when they viewed it? Do they think that the sellers are magicians and can make it all disappear? Abracadabra is a cool Steve Miller Band song, but will not help the sellers move out more quickly. Give them time. 3. Get pre-approved, not just pre-qualified. In a September 2013 colummn we covered the difference between a pre-approval and a pre-qualification. In a nutshell, a pre-qualification is an opinion based upon a short interview process whereas a pre-approval is credit score driven and all documentation referenced on the loan application has been verified. In my opinion, an offer presented without a pre-approval letter accompanying it is not worth the paper it is written on. I also think that the loan officer’s cell phone number is important. I always want to speak with the loan officer briefly before presenting it to my clients. Sometimes these offers come in over the weekend. That is why just an office phone number is not sufficient. Please remember: Cash is still king. No matter how strong the pre-approval is. In a bidding war, it is really hard to beat a cash buyer. Especially if they are waiving their right to an appraisal. 4. Make the offer as “clean” as possible. Just because your sister got all of her closing costs covered when she bought in 2012 does not mean that you should ask for the same. Your sister purchased in a down market and buyers have the opportunity to ask for more concessions from the seller in a down market. You, however, are purchasing in a seller’s market so the 2012 rules don’t apply. If you don’t need the seller to pay for a home warranty, then don’t ask for it. The same thing goes for closings costs or any other concession (like personal items or appliances to stay with the home). It may come down to two offers with the same sales price, but one is asking for more concessions from the seller. Don’t let a patio furniture set or a washer and dryer set keep you from getting your dream home! Please remember that there are no steadfast rules that sellers must follow when considering an offer. Sometimes they will surprise everyone with their response. Just keep in mind, as with most things in life, everything happens for a reason in real estate. If you miss out one house, that just means that there is a better one for you just around the corner. The title of this column may sound like it is intended to create a competition between these two NEJC cities, but it is not the case. Rather, I would like to offer a comparison of the two cities and how the real estate market in each is performing differently. I have said before that each city performs as a micro-market within a real estate market. The same can even be said for subdivisions at times. For today’s purposes, I have focused on Prairie Village and Roeland Park. The relationship between these two cities has been interesting over the last few years. By relationship I mean how the market in one has directly affected the other. Home values in Prairie Village have been soaring at an unsustainable pace since mid-2013. As values continued to climb, we have seen many buyers priced out of the Prairie Village market. First time home buyers found themselves competing with builders paying cash for homes. And in many cases, they were no competition. Small two bedroom homes that once sold in the $170,000’s were now selling for $200,000, and that was just for the lot value. Many buyers decided that the competitive PV market was not for them and they started looking elsewhere. This is where Roeland Park entered the picture. Now don’t get me wrong, Roeland Park has always been a great city. The difference is that now you could add affordability to its list of benefits. For example, the median sales price for homes in Prairie Village over the last two years has risen to $233,000. Compare that to Roeland Park with a median sales price of $170,000 and you can see why it has become so attractive to a new pool of buyers. 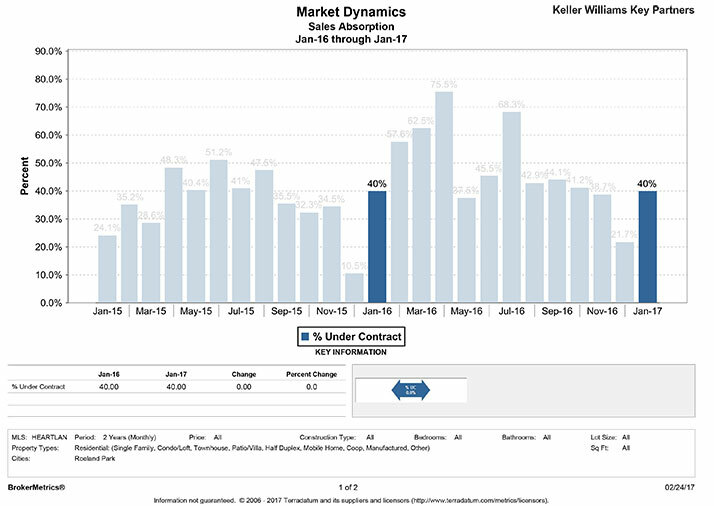 As you can see from the graph above, the percentage of homes that went under contract last month (28.4%) is down 32.9% when compared to January 2016 (42.3). Please also notice that the percentage of homes to go under contract increased from December 2015 to January 2016. Conversely, the percentage of homes from December 2016 to January 2017 has decreased. In other words, the demand is dropping. In addition, the absorption rate in January 2017 of 28.4% is the lowest that we have seen in PV in two years. Surging prices, in my opinion, have directly affected buyer sentiment. From the graph above, you can see that the percentage of homes to go under contract in January 2017 is dead even with last January at 40 percent. If you compare December 2016 to the previous December, you can see that the demand in 2016 stayed much higher (more than double) than the previous year. All in all, the Roeland Park real estate market is out-performing the Prairie Village real estate market. Okay, so maybe it is kind of a competition. The bottom line is that as affordability trends downward, buyers are forced to make decisions about how much they want to spend and where they want to invest their hard-earned dollars. Surging prices can be a double-edged sword for a seller. Every seller wants their home to be worth more money, yet when values go unchecked, buyers will eventually decide that enough is enough and either purchase elsewhere or not at all. If you look around, you will notice more and more real estate signs popping up. And although our area is still at a lower point of inventory, that trend is changing slowly but surely. If you have a home in Prairie Village that you are thinking of selling, now is the time. Because of the drop in demand, values will be soon to follow in order for sellers to compete. Don’t wait to sell and get caught up in a price war with your competition. Now is the time. If you have a home in Roeland Park, demand is high. And while demand is high, you should strike while the iron is hot and while interest rates are still relatively low. If you are selling a smaller home to move up in size, lower interest rates are working in your favor currently. But again, don’t wait. Rates are going to continue to rise as the Fed is poised to raise the federal funds rate three more times this year. What costs are involved in buying a home? It’s a question we get all the time. Let’s answer this question in chronological order. A buyer’s first out of pocket expense will be an earnest money deposit (or EMD). This represents some “skin in the game” from the buyer to the seller. Usually we are talking 0.5 percent to 1 percent of the sales price. The check is not given directly to the seller. It is either held by the seller’s title company or the real estate brokerage representing the seller. The EMD will be credited back to the buyer at closing and applied to closing costs and pre-paid expenses that are due. We will get to those in a minute. Second, a buyer will need to pay for a series of home inspections, which can cost up to $1,000. For $1,000, a buyer will get to know their future home intimately. Inspections may include a whole house inspection, a termite inspection, a chimney inspection, a radon test — and, last but not least — a waste line inspection. In our experience, buyers who see inspections as an investment rather than an expense always get more value out of them. Our philosophy is that the more informed buyers are, the more comfortable they are with their purchase. Once inspections are completed and both buyer and seller have agreed on the list of repair items, we arrive at step three: the appraisal. To arrange financing for a purchase, the lender will require an appraisal to make sure that the house is worth what a buyer is willing to pay for it. The buyer pays for the appraisal at the time that it is ordered (typically using a credit card). Most appraisals run about $400. We are getting towards the end — just two steps to go. Next, let’s talk about down payments. I know this feels like it should be at the beginning, but a buyer’s down payment is not collected until closing. Some of you may have heard about 100 percent financing options that are available. Sounds tempting, right? Well, those days are pretty much gone with two exceptions: VA loans (for those who have served in active military duty) and USDA loans (for rural purchases). That said, there are still great financing options available. The two most popular are FHA loans (which require a 3.5 percent minimum down payment) and Conventional loans (which require a 5 percent minimum down payment). Consult a competent loan officer on which product is best for your financial situation. And, finally, a buyer will have closing costs and pre-paid expenses (taxes and insurance) due at closing. As an example, a buyer purchasing a $200,000 home would pay $4,000 to $4,500 in closing costs and pre-paid expenses. In our market, however, it is not atypical for a seller to cover some or even all of a buyer’s closing costs depending on the price range. That’s because the benefits of hiring a buyer agent are tremendous. The gift of buyer agency has only existed since the early 1990s. Until that point, all buyers worked through the listing agent when purchasing a home. The challenge with that scenario is that the listing agent represents and works for the seller exclusively. Therefore, they were only assisting the buyer, not representing them. This would be like hiring your spouses’s lawyer to represent you in your divorce. Doesn’t make much sense does it? Yet I see buyers in today’s market doing exactly that: reaching out to the listing agent directly to purchase a home rather than obtaining their own representation. This rogue method could cost you tremendously in the long run. How will you know what a fair price might be for the home? What inspections are most common in our market and who can you trust as an inspector? What can I ask the seller to repair from inspections? I could go on and on. The buyer pays the agent’s commission. False. In our market, the seller is contractually obligated to the listing agent to pay a listing commission. The listing commission is made up of the buyer agent commission and the listing agent commission. It is not always a 50/50 split, but in most cases it is. Therefore, the seller actually pays the buyer agent commission. If I don’t have a buyer agent, I can get a better deal. False. Oftentimes, buyers might think that if they don’t have a buyer agent they can get a better price on the home because the seller is not paying a buyer agent commission. In truth, the listing commission is a prearranged agreement between the seller and the listing agent and is not negotiable by the buyer. So, in essence, an unrepresented buyer is simply giving up his or her right to representation while at the same time paying the same price for a home. I don’t have to sign a buyer agency agreement until I find a home. False. For a Realtor to represent you and coach you through the home-buying process, he or she must have a signed buyer agency agreement. Not only does this document allow for the Realtor to provide you with the representation you seek, it also lines out the buyer’s responsibilities to the agent. For example, the buyer should not call other agents to see properties or provide personal/financial information to any other agent. Even if a buyer thinks that she is saving her agent’s time, the aforementioned scenarios can seriously affect your leverage as a buyer. In essence, a signed buyer agency agreement clearly defines what each party can expect from the other and shows loyalty to one another. All buyer agents are the same. False. This could not be further from the truth. It astounds me that sellers often interview more than one listing agent for the job, but buyers will often hire the first nice Realtor that they meet at an open house. I am not saying that open houses aren’t a great way to meet agents, but it is only the first step. A buyer should interview all candidates to see about their track record in real estate. How many clients have they assisted in their career? How many homes have they sold in your desired area? Are they a full-time Realtor? Do they perform a detailed buyer consultation to ensure that they understand your goals and must-haves? To me, part of the value of great buyer agents is that they are in the market every day. They know what a great value looks like and they are confident enough to tell you when it is time to make an offer on a home. A great buyer agent should also be a hunter. They don’t wait for the market to bring them your home, they proactively network with other Realtors, their clients, and their social network to see who might be thinking of selling. This is crucial in today’s low inventory market. In most cases, buyers should be prepared to compete with other buyers when their home comes on the market. Therefore, you need a buyer agent who will alert you, not the other way around, when a great home hits the market. And then you need a bulldog who can fight to get you the home and negotiate on your behalf. I have answered this question numerous times over the last few weeks. As the real estate market is gearing up, it seems that sellers fear under-pricing their home and buyers don’t want to overpay. It is like a dance between the two sides, with both parties focused on the same thing: sales price. Sellers and buyers alike seek out as much information as possible when they begin the process of either selling or purchasing a home. And all of them start their research online. Now for those two dirty “six letter words”: Trulia and Zillow. As a Realtor, I love the syndication (online exposure) that our listings receive on websites such as Trulia and Zillow. The more exposure our sellers receive the better in my book. However, the valuation models on Trulia and the “Zestimates” on Zillow are HIGHLY inaccurate. Kansas and Missouri operate as “closed record” states, meaning data on sold properties is not shared with the open market. That data is only shared with the Realtor community and tax entities. In some parts of the country, Trulia and Zillow are highly accurate — but those are areas with “open record” laws. In closed record states, Trulia and Zillow use tax appraisals for valuation. Again, in our market, the tax appraisals are inaccurate. Some are higher than market value, some are lower. When you think of Trulia and Zillow in our market, I want you to think of them like Web MD. If you are a bit of a hypochondriac, like me, or if you have kids then you have more than likely “Googled” a symptom or two. And like Trulia or Zillow, you can get some good information from Web MD. But in most cases, even the slightest of symptoms, can quickly lead to a terminal illness on Web MD because they are covering all of their bases and working with the limited information that you provided them. In this comparison, Zillow and Trulia are doing the same. They are working with very limited information and although some of the info, like neighborhood stats, can be useful, the overall diagnosis (fair market value, or Zestimate, or whatever goofy name they choose) can easily lead to an extreme outcome. And the extreme outcome could be grossly mispricing your home. In a lot of ways, the real estate market is like the stock market. Just as a stock can be worth a certain value one day and a different value the next, a home’s value can do the same. Sold comparables around your home can bring the value up in an inclining market, and distressed properties (short sales and foreclosures) can bring it down. It takes a full-time professional Realtor to confidently interpret market value. You just can’t beat the first-hand experience of being in and out of homes all day. Your Home: A new year is here. How is the market? “How is the market?” and “How’s business?” are usually the second or third sentence in most of my conversations these days. And I love it! I love the fact that the real estate business touches everyone that I come into contact with on a daily basis. Even people who do not own a home are interested in the real estate market. And rightly so. They may one day own a home, and if not, their parents probably still do. Or perhaps their significant other. And the list goes on and on. One way or another, the real estate market is a part of their life. This year, after a polarizing presidential election, the question has carried a little more weight and for some because of the uncertainty. And although most of my research has shown that presidential elections do not have a significant impact on the real estate market, I would bet that when the numbers come out, this year will be different. The silence was almost deafening on the days before and after the election. Buyer sentiment is a big factor in our business and during that period buyers were hesitant, to say the least. But now that the calendar has flipped to a new year, how is the market performing? Buyers: The biggest story for potential buyers out there is that interest rates are up and have jumped up significantly post-election. Home values appear to be holding steady for the moment. Depending upon the level of demand in the coming weeks, we could see a slight increase in home values heading into the spring months. If values rise and rates continue to go up, buyers could find themselves priced out of the market. The Fed, according to their December minutes, is still expecting a gradual normalization of rates as they look ahead to the coming months. But even a quarter or half point increase in a buyer’s interest rate will have an effect on overall affordability. Therefore, if a home purchase is on the horizon for 2017, I would strongly suggest that you speak with a mortgage lender at your first opportunity. Mike Miles of Fountain Mortgage, who also happens to be a columnist here on the Post, would be an excellent resource. The other benefit for potential buyers currently is that in most parts of town we have more housing inventory than we have seen in years. Don’t get me wrong, overall inventory levels are still pretty low. But compared to the scarcity of housing that we have seen over the last couple of years, today’s inventory levels present a buyer with more options. Keep in mind that each price range performs independently of another, therefore it is important to know the level of demand in the price range that you will be purchasing. But overall more housing options for buyers is a good thing. Sellers: Potential home sellers out there should be on alert. And I am not trying to be dramatic. The overall housing market is shifting and based on today’s numbers, the strong seller’s market that we have enjoyed for three years is on its last leg. As I said earlier we are still in a seller’s market at this time, but compared to what we have experienced in the last couple of years, we are now shifting towards a more balanced market. This shift towards a balanced market means more competition for sellers out there. More competition means a higher standard of condition and potentially a more competitive price. Therefore, sellers could find themselves investing more money into updating their current home (which they intend to sell) while at the same time selling it for a lower price. Supply and demand will dictate how the market trends in the coming months. And as with most things these days, it seems that the market shifts and changes much more quickly than it did in the past. If you have additional questions about the current market conditions, please email me directly. After 13 years in the wonderful business of real estate sales, I have seen my fair share of inspection reports. I remember early in my career as a Realtor feeling the shudder of fear when I received the inspection results on one of my earlier listings. Inspections can make or break a real estate sale — especially when you specialize in the resale of homes built in the mid-1950s. Fast forward to today, and I welcome inspections on our listings. One of the reasons is that we perform pre-inspections on all of our listings and have done so for about two years now. Over the years, I have come to realize that one of my jobs as a listing specialist is set the stage for the entire selling process from day one. Part of setting the stage and clear expectations is to help the seller see their home as the buyer will see it. For most of my clients, the sale of their home is very personal for them. And in some cases they may wear “rose colored glasses” when they look at their current home. Said glasses prevent them from seeing some of the deficiencies that need to be addressed. A pre-inspection is one of the first steps toward separating yourself emotionally from your current home which then allows a seller to see the repairs that need to be done to prepare for the open market. When selling a home I have found that the best offense is a good defense. This week, I thought it might be useful to discuss some of the observations that come up consistently on most home inspections. I reached out to my good friend and trusted partner, Mike Faulconer with The Home Team. Our team has worked with Mike and his team for years. Many of our buyers utilize The Home Team for their whole house inspection when they purchase a home. In addition, Mike’s team performs all of our pre-inspections on our listings. Last year alone, The Home Team performed more than sixty pre-inspections for us so they are quite proficient at what they do. Grading and drainage. Good ol’ grading and drainage. We see this come up on almost every inspection. And it does not matter how old the home is for it to be an issue. Properly maintained grading (slope) of the soil away from a home’s foundation and downspout extenders are easy to address and easy to overlook. Yet these two water maintenance items can make or break the life and stability of a home’s foundation. A good rule of thumb is to have an inch of elevation decline every foot for at least six feet or more from the foundation walls. And then make sure that your downspouts aren’t just dumping right next to your home. Even if you have splash blocks receiving the water, get the water far away from your home. Wood decay on exterior trim. Depending upon your home’s exposure to the sun and how much shade that you have, this one can be a small or big issue. And in most cases, a homeowner does not know the extent of the decay until an inspection is completed. In short, simply call someone who specializes in wood rot and have them evaluate your home prior to selling. Wood rot is not only unattractive, it can allow water to penetrate your exterior which can cause much more serious problems so it is better to catch it early. Minor electrical repairs. These are pretty easy to address and do not always require an electrician. In most cases these repairs could be installing a cover plate on a junction box or an electrical outlet. Some homeowners and most handymen would be completely comfortable with this repair. Other common electrical issues are electrical splices that are not in a junction box or wires that should be run through conduit for safety reasons. Another common issue is the absence of GFCI outlets, you know the ones with the little buttons in the middle of them. These are required within 6 feet of any water source and are also suggested for any exterior outlet. When in doubt, and for safety and liability reasons, it is always smart to consult a licensed electrician. Insufficient or missing attic insulation. This one is self explanatory and most prevalent in older homes. Lack of insulation is not a safety issue, but can be a hot button for certain buyers. Chimney issues. Oh boy! This one can be a big one. If you have a chimney and have not had it inspected recently, I would strongly suggest that you do so. I have written about chimney safety before, therefore I won’t spend too much time on this topic. At a minimum, a seller should have a visual inspection of their chimney completed by an inspector or a licensed chimney sweep to ensure water is not penetrating the exterior of the chimney anywhere. This can happen in many cases without the seller knowing and can then cause other problems. Depending upon how a seller uses the chimney and fireplace, it would be a good idea to consult a Realtor on the potential issues that could come up when selling a home. Ok, so I have to throw one last item in from my own list. And it makes me laugh almost every time that it comes up: loose toilets. Thats right. Loose toilets. Either the toilet tank is loosely mounted to the base, or the base is loosely mounted to the floor. It is an easy repair and for some reason most sellers never realize that their toilet has a little wobble. Well, here we are at the end of another banner post-recession year in real estate. It has been a wild ride this year with historically low inventory coupled with unbridled buyer demand. Home values, in most areas, are currently higher than the peak (2006) that was reached prior to the recession. 2016 has been so fast-paced that it has been challenging to predict where things might be headed. Therefore, I thought it would be fun to re-visit some of our columns from earlier this year to see how we did. Let’s begin with our column from March 4, 2016 entitled “Are today’s home values sustainable?” In it, we discussed the fact that home appreciation in Kansas City for 2015 was 6.1 percent. A sustainable level of appreciation is considered to be between 4 and 6 percent annually. Appreciation higher than that is considered unsustainable and will require a market correction to prevent buyers from being priced out of the market. So where are values as of today? In the Shawnee Mission School District, median home prices are up 6.9 percent as of the end of November when compared to values at the end of November 2015. Now let’s look at the Blue Valley School District where median home prices are up 13.9 percent during that same time period. Both markets are clearly out of the sustainable range, though Blue Valley has certainly seen much more rapid appreciation. But are the values sustainable? That depends on what happens to inventory after the first of the year. Currently the supply of homes for sale has nearly doubled since its lowest point this year in March in the BVSD. Much of that increase is being caused by the rapid increase in home prices. If inventory stays up, then inevitably home prices will have to come down in order for a seller to compete. The SMSD has seen almost exactly the same trend. Inventory has nearly doubled there as well. Therefore, we will know soon if today’s prices have a limited shelf life. Now, let’s jump to May 20, 2016, when our headline was “60 percent chance of rate hike in June or July.” Wah, wah! That one did not come true. The Fed did not increase the Federal Funds rate in June or July. Instead they waited until about two weeks ago. The inarguable strengthening of the economy gave the Fed all the justification that they needed to increase the benchmark rate for only the second time in a decade. Interestingly, the market seemed to have already built in the rate increase because post-election rates have been rising steadily. I cannot tell you how thrilled I am to finally not be crying wolf about interest rates. No one every expected rates to stay so low for so long. But those days are now gone. Now our job is to wait and see if the Fed follows the current plan of three more increases in 2017. And the question becomes, how much of an increase? With inflation on the horizon, unemployment at 4.6 percent, and 73 months of consecutive job growth, the sky is the limit! On May 6, 2016 I wrote, “Shift is here?” I know, I know. I have been talking about a shift a lot lately. And that is because it is a big deal because it affects both buyers and sellers. I can talk numbers all day long, and the numbers do support that we are seeing signs of a market shift or correction from such a strong seller’s market to more of a balanced market. But much of my talk of the shift is being driven by buyer sentiment. For the first time post-recession, we are seeing buyers making low ball offers. We are seeing buyers walk away from a purchase if they don’t get what they want when it comes to inspection related repairs. We are seeing feedback from showings that seem very “nit picky.” These are the first signs of a market shift. I say that because buyers are saying enough is enough. They are tired of paying top market value for a home and having no leverage during the process as well. If this sentiment continues, then we will see a correction in the market. And as rates continue to go up, buyers will question the price they are paying for a home because the cost to borrow is higher. I have never claimed to have a real estate crystal ball. However, I do my best to keep our readers ahead of the market trends and will continue to do so in the new year. I trust that our column brings value to you, and please know that we welcome your thoughts and suggestions as to how we can bring even more value to our readers. Happy New Year to you and yours and as always, thank you for reading our column and for supporting the Shawnee Mission Post. Even though the temps should approach the 50s this weekend, it may be a great time to tap into the holiday market. Yes, there is a holiday market in the real estate world. It may not have the frenzied feel of Black Friday, but it can still be a great time to get a good value. Right now in our area, the inventory levels are still showing a seller’s market. 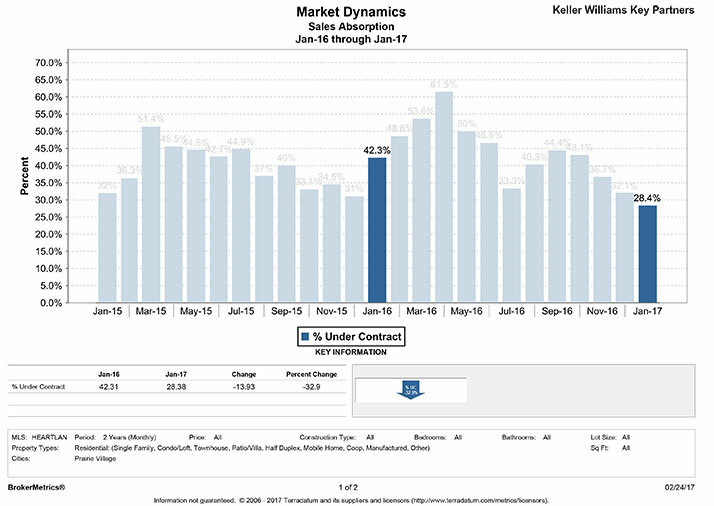 However, we have seen the numbers of contracts received on homes decline and those inventory numbers are up from just a few short months ago. On our own listings, we are seeing homes that would have sold day one with multiple offers in the summer now taking a week or so to sell. They are still selling for top dollar, however, buyers are now enjoying a more calm home buying environment where they can make a calculated decision instead of a rushed one. So maybe it is time to call your favorite Realtor, run through the Starbucks line and hit the streets. Home prices have been on the rise for the last three years and affordability is slipping away, especially with interest rates going up. Clearly the message to potential home buyers is that you should add a home to your holiday list of things to get. Don’t mentally check out until spring. You don’t want to search for a home when you have a ton of competition (other buyers). You need to buy now. Additionally, and most importantly, interest rates will be higher next year. And not at the end of next year, at the beginning. I know, I know…I don’t have a real estate crystal ball. But the feds position is clearly to raise the benchmark federal funds rate three more times in 2017. Sellers out there, if you were going to buy a lottery ticket to win $1 million, would you rather buy a ticket if your odds were one in a million or one in fifty? Of course, one in fifty right? Isn’t selling your home in the winter kind of like the one in fifty lottery ticket? As a seller today, you not only get to compete in the market with little competition, you also get to benefit from the fact that typically people don’t go look at houses when it is 20 degrees outside just for fun. They are out because they need or desire to buy a home. You see, mother nature filters out the looky loos for you in the winter. Therefore, if you are going to keep your home show ready for each and every buyer, wouldn’t you rather each and every buyer be highly motivated to buy? Of course you would. 1. Make sure that your photos in MLS are shot on a sunny day. You want to be sure to show the full potential and beauty of the home and most of the other homes in MLS will look grey and gloomy. This will help you stand out on line. 3. Be sure to keep driveways, walkways, and sidewalks clean during inclimate weather. You don’t want any potential buyers to slip and fall on their way inside the home. And you want them to feel welcomed. 4. Keep the house warm. A warmer inside temperature will keep potential buyers inside longer and allow themselves to feel more at home. 6. Create an atmosphere. Put on some holiday music. Leave out some sweet treats or even some warm apple cider. Pull out all the stops. Remember that a home purchase is very emotional for most people. Bring back some great holiday feelings for your potential buyer by creating a holiday setting and hopefully next holiday season they will be celebrating in your current home and you will be celebrating in your new home. Well, today’s historically low interest rates are going, going, almost gone. Post election, interest rates had already jumped up a bit. Add to that Wednesday’s announcement from the Fed that they were raising their benchmark (federal funds) rate for only the second time in a decade and the combination equals higher interest rates for a borrower. The last time the fed increased the federal funds rate was December of last year. Interest rates rising is not all bad, right? If you have money in a savings account you may actually be able to make a little money on it now. Also, the Fed has justified their recent move to raise the benchmark rate by acknowledging the strength of the overall US economy. Unemployment is at 4.6 percent as of the end of November which is the lowest unemployment that we have seen since 2007. Although we are not seeing the 2 percent inflation target that the Fed has set yet, indications are that the economy is headed in that direction. So overall this is good news for America. The biggest news from Wednesday’s announcement was the change in the Fed’s plan to raise rates three times in 2017 versus the previous plan of only two rate increases. This may cause rates to increase at a slightly higher rate than was first anticipated by the markets. So how will the higher rates affect you? That depends. Are you thinking of selling a home, or buying a home, or both? Higher rates=smaller buyer pool. Not only do higher interest rates reduce a potential home buyer’s budget, but in some cases the higher costs of borrowing can take someone out of the market altogether. It is all about dollars and cents. As rates continue to rise, some buyers will be forced out of the market to purchase a home. This trend tends to start at the first-time home buyer price range and then has a domino effect moving up from starter home, to second home, and so on. If starter homes have a challenge selling, then those sellers cannot by the move up home. Then that move-up homeowner cannot purchase their next home. Well, you get the picture. Now to the buyers out there. Higher rates=less home for the same price. That’s right. The rule of thumb is that for every 1 percent that your mortgage interest rate increases, you must purchase a home for 10 percent less in price to keep the same monthly mortgage payment. So if you are currently looking at $350,000 homes with an interest rate of 4 percent to stay within your budget and rates go up to 5 percent, you would then need to look at no more than a $315,000 home to keep your payment around the same amount. That $35,000 drop in purchase price can make a big difference in the quality, size, or location of the home that you would like to purchase. Higher rates=less affordability. Housing affordability has been at an all-time high for years now due to historically low interest rates. To put that number in perspective, historically it has taken 21.6 percent of an American family’s household income to pay their home mortgage each month. In 2014, that number was 15.2 percent and then it dropped slightly to 15 percent in 2015. Essentially, low interest rates have given the American family an additional 6 percent of their household income to invest elsewhere. As rates go up, that luxury will slowly slip away. Overall, the Fed’s move this week is an endorsement of the American economy. And rising rates are a natural part of our economic cycle. I spoke the the Post’s own Mike Miles with Fountain Mortgage this week and he felt that the market will settle down a bit in the coming weeks. However, he did say that the days of a 30 year mortgage at less than a 4 percent interest rate are a thing of the past. At lease for the foreseeable future. If you have real estate plans for the new year, call or email us today to discuss how there recent changes in the market may affect your timeline. If a purchase is on the horizon for 2017, I would certainly recommend that you reach out to a trusted lender, such as Mike Miles from Fountain Mortgage, sooner rather than later.